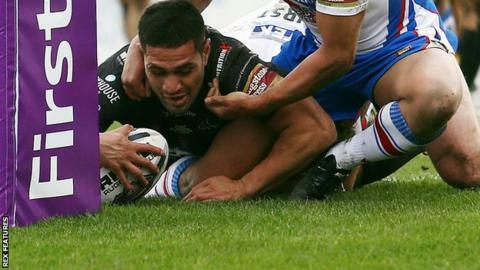 Widnes started their Super League season with a comfortable four-try win at Wakefield. The Wildcats, who finished bottom of the table last year, opened the scoring when Stu Howarth dummied and crossed. Vikings forward Setaimata Sa, on his debut, crossed twice along with Rhys Hanbury to give them a 18-4 lead at the half-time. Reece Lyne and Mikey Sio gave the hosts hope but Lloyd White's score secured two points for Denis Betts' side. On a windy afternoon which saw steady rain fall throughout the game, Widnes secured their fourth win in a row against the Yorkshire side. Brian Smith, who has made 12 new additions to his squad since last season, takes his team to Castleford next week, while the Vikings welcome defending champions Leeds. "There are some obvious disappointments in the game but the pluses probably outweighed the minuses today. "I won't be saying that in eight or 10 weeks time but some of the things we need to fix from today's game can be fixed. "We were chasing the game and finished up with about a dozen errors. If we can cut those in half, we will give ourselves a chance of winning, particularly if the guys continue to work hard for each other." "Winning is what it was all about. Away from home, against a team who have given themselves a completely different look, it's a hard place to come. "We've not got out of third gear and it's hard to say how good we can be on attack but defensively we were really strong." Wakefield: Jones-Bishop; Johnstone, B Tupou, Arundel, Lyne; Miller, Finn; Scruton, Howarth, England, Ashurst, Kirkmond, Arona. Replacements: Sio, Anderson, A Tupou, Molly. Widnes: Hanbury; Thompson, Bridge, Runciman, Ah Van; Mellor, Brown; O'Carroll, White, Dudson, Sa, Farrell, Cahill. Replacements: Dean, Manuokafoa, Houston, Heremaia.